Francesco is a BACP Accredited Counsellor and Supervisor. He has been seeing clients for over ten years in his private practice and at Terrence Higgins Trust. He sees individuals as well as couples. 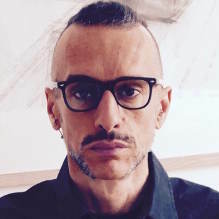 Francesco has a lot of experience working within the LGBTQ community, HIV and AIDS support, Chemsex and also with people working in the Music, Art and Entertainment business. He has a background in music as a Singer, Lyricist and Songwriter. Francesco says: "I am interested in self development as a transformative space that we create in the midst of opposites and extremes, fed both by suffering and thriving, tears and laughter, movement and stillness, shadow and light, an inclusive pliable space where we can learn, grow and expand from the depth of our roots to the height of our potential.